Construction of EUTELSAT 172B, the first high-power all-electric telecommunications satellite built in Europe, has now been completed at the Airbus satellite assembly facilities in Toulouse. The EUTELSAT 172B satellite during the final testing process. The fully fledged satellite for Eutelsat is now undergoing final testing before being sent to Kourou, French Guiana, for an Ariane 5 launch that's scheduled for April. EUTELSAT 172B breaks new ground as the first high-power satellite in the 3 ton class. The satellite combines electric power of 13 kW with a launch weight of only 3,500 kg. This highly innovative satellite will host three distinct payloads that will strengthen Eutelsat’s capability to serving APAC markets: a C-band payload, a regular Ku-band payload and a high throughput payload specifically designed for in-flight connectivity along Pacific air corridors. 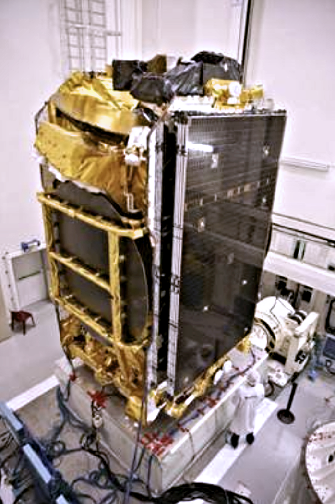 EUTELSAT 172B is based on the highly reliable Eurostar E3000 platform from Airbus Defence and Space, in its latest EOR (Electric Orbit Raising) evolution. This version relies exclusively on electric propulsion for initial orbit raising and all on-station maneuvers, with the consequent reduction in mass enabling the satellite to be launched in the Ariane 5 lower position, resulting in lower launch costs.